Sixty slots were available for people to speak at this month's regular monthly meeting on Wednesday, September 24, 2014, at the Chicago Board of Education (BOE) at 125 S. Clark Street. Only twenty-six people signed up to speak. Of those twenty-six, seventeen actually spoke. Eight were "no-shows." An alderman and the head of the Chicago Principals and Administrators Association also spoke. So, despite Board members having a lot to say, the meeting ended much sooner than it normally does. Public Participation ended at noon. More Board comments followed before the Board went into closed session. Glibly responding to an outpouring of criticism of the most recent privatization of custodial services, Chief Accountability Officer Tim Cawley told the Board that during that closed session, Board members were to eat lunches provided by Aramark, the organization that provides lunches for the schools and also provides cleaning of the schools. This reporter did not return to Board chambers after the closed session ended, so was not able to hear any Board comments on the Aramark lunches. Present at this month's Board meeting were Board members Dr. Henry Bienen, Dr. Mahalia Hines, Board Vice-President Jesse Ruiz, Board President David Vitale, Andrea Zopp, Dr. Carlos Azcoitia, Deborah Quazzo and Chief Counsel, James Bebley. Absent was Chief Executive Officer (CEO) Barbara Byrd-Bennett. Vitale said that Byrd Bennett had to be away for "personal reasons." CPS 'Chief Accountability Officer' John Barker presented a Power Point to the Board claiming that first day attendance was the highest in history. Substance photo by George N. Schmidt.The meeting began with a Power-Point Presentation by John Barker, "Chief Accountability Officer." Barker's information indicated that first day attendance was 93.77%, which he said was "the highest on record." Barker's presentation also mentioned two "success stories" from teachers: Judith Benjamin who has been employed for 47 years in CPS, one of the two longest in the district, and the other being James Fitzgerald, who began his 47th year at Hubbard High School. Both began working at CPS on September 4, 1967. Also mentioned was Darion Radcliff, of the Jackie Robinson West Little League Team, who is an eighth grader at Byrne Elementary School. Barker claimed that the two teachers were so busy teaching that they couldn't be at the Board meeting. Next four schools and their principals were honored for attendance at a rate that Barker said was "above 99%." The schools were Crane High School, Hefferan Elementary, Oscar De Priest Elementary, and Kershaw Elementary. After that, an announcement was made that representatives from Chicago Public Schools (CPS) and academic departments will be on hand to share information at the "Continuing the Path to College and Career Chicago School Fair" on Saturday, October 4th and Sunday, October 5th, from 8 a.m. to 3 p.m. at McCormick Place. Board President David Vitale said that the October 4 "fair" was being sponsored by ParentPower Chicago. He didn't mention that the newly formed group is already controversial. Other announcements were that the Board is still seeking a junior or senior to be an honorary student Board member, the application deadline is October 1st on the CPS website. As usual, office hours to meet with individual Board members are available by calling 773-553-1600. Sign-up for public participatioin for the next Board meeting (of Wednesday, October 22), will occur later than usual because of the Columbus Day holiday (October 13). Sign-up will begin at 8 a.m. on Tuesday October 14 and end at 5 p.m. on Monday October 20. First to speak during public participation was Rita Ortiz, principal of William Dever Elementary School, who spoke about extreme overcrowding at the school. She was brought to the podium by Alderman Nick Sposato, who was brought to the front before the rest of the public speakers as is usual for elected officials and union leaders. According to Ortiz, space at the school was reconfigured, but not expanded. Art and Music carts go from room to room, there are double classes in the gym, class sizes are growing, and every room is utilized. Because of overcrowding, the Parent Teachers Association (PTA) meeting was held on the steps of the school one day last week. She stressed that there is a great need for relief of the overcrowding by adding space to the facility and not simply by moving walls and doing other adjustments inside the existing building. Alderman Nick Sposato of the 36th Ward also addressed overcrowding at Dever. Introducing Ortiz, he mentioned meeting with "the awesome principal and staff at Dever" at a meeting put together by the principal and urged the Board to fix the overcrowding problem. 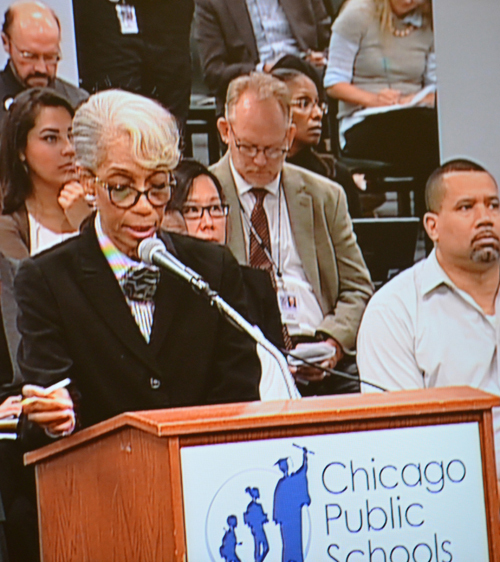 Clarice Berry, President of the Chicago Principals and Administrators Association, criticized the Board for the Aramark and Sodexo Magic custodial contracts. She received no reply during her presentation. The Board waited until after she had departed, then called on Chief Administrative Officer Tim Cawley to repeated the claims he had made in February that the Aramark contract was going to be good for the schools. etc. etc. etc. Substance photo by George N. Schmidt.Next, Clarice Berry, head of the Chicago Principals and Adminstrators Association (CPAA), told the Board members forcefully that principals have no confidence in custodial vendors Aramark and Sodexo-Magic. She said that at a tumultuous meeting, principals said they wanted the Board to restore supervision of custodial workers to principals, noting that the CPAA had worked with CPS to get that into legislation in the past, and that the Aramark contract was a diversion from that policy and law. She stressed that the principals were not consulted, in violation of the Illinois School Code. She repeated that loss of principal supervision is at the core of the problems. She added: "we don't want middle managers" from Aramark and Sodexo in the way of clean schools She concluded that children shouldn't have to learn nor teachers to teach in dirty schools. Jennifer Biggs, of the Sheridan Elementary School Local School Council (LSC) and Raise Your Hand, also spoke of the mess created by the change in custodial services by CPS. Referring to a survey, she said that there were concerns about safety as well as cleaning. She said that teachers and parents wanted to know who was there in the schools and were the backgrounds of the custodians checked by Aramark. She told the Board that teachers felt it was not safe not to know who is in the building at all times if they were working late. She said it was hard to get straight answers and there has been a drop in cleanliness. She then dramatically told the Board about one incident in her school. She said that a student had vomited on the rug in a classroom on Friday and on the following Monday, dried-up vomit was still on the rug and that a book that had also caught the vomit was still lying in the room. Then, Norine Gutekanst, of the Chicago Teachers Union (CTU), spoke of funding challenges, saying that classrooms are dirty, we seem to have a bargain-basement cleaning staff, class sizes are creeping up, and not all children have access to early childhood education. She noted that the number of children enrolled in pre-school decreased last year. She admonished the Board that they had a responsibility to provide for a world-class education and to find funding for this. She added that the Board has the opportunity to recover funds and to file for regulatory review on the "swaps" that CPS had entered into a decade ago. After that, Margarita Vasquez, of Hanson Park Elementary, continued to bring before the Board the problems facing the overcrowded Northwest Side school. She spoke in Spanish which was then translated. She spoke of the need for an the construction of an annex at Hanson Park and what the Board claimed was the lack of funds for this. She said that some minor fixes had been done at a leased facility, but the electricity system was faulty and could not handle air-conditioning and the thermostat was also faulty. Classrooms got too hot because the heat could not be regulated. She said the lease for the leased building expires in June 2015. President Vitale said a meeting had been scheduled at the school in the next few weeks, but he did not know the date. Maicela Tello, of "Communities United for Quality Education," said that two hours was not enough for a quality pre-school. Two hours allowed only enough time for students to "write their names, eat a cookie, and draw," she said, criticizing the fact that CPS officials and Mayor Emanuel were touting the city's pre-kindergarten programs while ignoring the facts. She noted that mothers need more time than two hours to go to work. Saqib Bhatti, of the Roosevelt Institute, spoke of swap deals. He said that when the banks crashed, the Federal Reserve dropped interest rates. He stated that there is something CPS can do to get money back by asking for arbitration to disclose whether when presenting the original swap deals to CPS the banks had disclosed the risks as well as the possible rewards. He added that the banks did not deal fairly with other districts and that the arbitration could enable Chicago to recoup a great deal of money. Then the charter school cheerleaders began their presentations. This is a regular feature of the Board meetings. First, Debra Garner, of the West Side, said she has a son at Urban Prep High School. She said that when her family moved to Chicago, they were unhappy with her son's school, describing the local real public school in the usual lurid terms that come during the charter presentations. She said that she chose Catalyst charter school [no relation to Catalyst magazine] because her son was not learning at his previous school. She praised Catalyst School and said that her son's grades have improved and that he has been put on the honor roll. The tribute to Catalyst charter school was followed by another of the Noble charter school miracle stories. Gloria Munoz spoke of Noble Street charters, telling the Board the usual stories about a poor family that made good thanks to the charter school. She said that her mother and father had only a sixth-grade education and didn't have money for school. Her mother stressed wanting her children to go to college. All the children in the family have attended Noble School-- and all have succeeded in college, she said. She then named all the achievements of her sisters and brother with college for all, with one still attending Noble School. She said that her sister plans to attend Yale University and that she is a graduate of Stanford who is now returning to teach at Noble. Robert Lamont, of Vets for Peace, said there is a need for conflict resolution and non-violent decision-making. He remarked that children learn what they are taught. A packet was distributed to the Board members, who were observed ignoring it. He said that forcing conformity is the military model and that Chicago needs to break away from that. 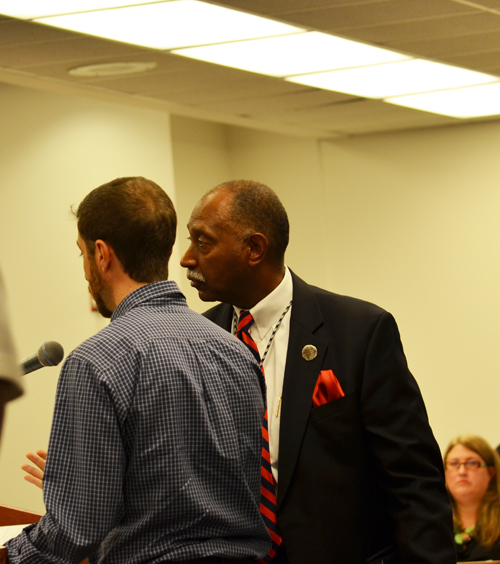 Chicago Teachers Union Staff Coordinator Jackson Potter tried to get the Board to agree to go to arbitration over the so-called "toxic swaps" that were entered into during the years when Arne Duncan was CEO of CPS, but the Board members wouldn't discuss it while Potter was at the podium. Instead, they waited until after Potter had left, and then following public participation tried to debunk Potter's position. Board President David Vitale again talked about how people try to bring "facts" before the Board, but the Board knew what Vitale monthly calls the "true facts." Board Vice President Jesse Ruiz noted that the arbitration might or might not provide the Board with the money Potter suggested could be retrieved. With the deadline looming, it looked like the Board members were going to continue the cover up of the Arne Duncan decisions to enter into the swaps even though at the time Duncan did the deeds it was not legal to do so. The Board only established a policy for swaps in 2008, years after Duncan had secretly entered into them, apparently believing that they would "pay off" and could then be announced as a great idea. Substance photo by George N. Schmidt.Jackson Potter, of the Chicago Teachers Union told the Board that he had concerns about resource allocation, fixing his attention on the possibility of revisiting the "swaps". He said there had been a cut to funding for all baseball coaches and that we don't need to choose between Art, Physical Education (P.E.) and Music. He referred to President Vitale's bank, saying it's "a good bank" in relation to the swaps issue, but that's an oxymoron. He said that the state of Alabama had gotten significant money back after renegotiating "toxic swaps" after arbitration disclosed that the banks had not disclosed the risks when marketing the swaps to them. He said that you have time to talk about this now because the deadline for signing up for the arbitration was fast approaching. He added that "you are the stewards of this district, why not have this debate right here and now? Don't sit on it..." The Board members refused to discuss the matter with him, and instead waited until he had left at the end of public presentation to talk about how Potter might be wrong. Yvonne McGinnis, of "We're Cleaning, Inc.", told the Board that she was owed $89,000 and made an emotional and dramatic plea to get paid. She received no response. She said it has been two months now and she asked, "Where's my $89,000? What happened to my money?" She added, "Where's the justice when I have to ask you where is my money?" She said that she had been in business 30 years and feels that this is a hate crime against her and her company. She added that she is 70 years old. Fideliz Nunez, of Garinagu Lun Awansruni of Chicago, Inc., requested Board support to promote and celebrate Garifuna heritage in CPS. He asked that the contributions of Garifuna-Americans and immigrants in the state of Illinois be honored. Carlos Azcoitia of the Board asked the speaker for more information about the number of people from that ethnic group in Chicago. Then is was back to the charter praisings. Myisha Shields, of Catalyst Maria Charter School, said she is a mother of five children at Catalyst who were formerly at Marquette Elementary, which was closed three years ago. She said that they are doing very well now. She added that one is blind, one is terminally ill, and one is asthmatic. She mentioned that the teachers say: "You're never too disabled to learn" and in tears thanked Catalyst charter school for what it's done to serve her disabled children. 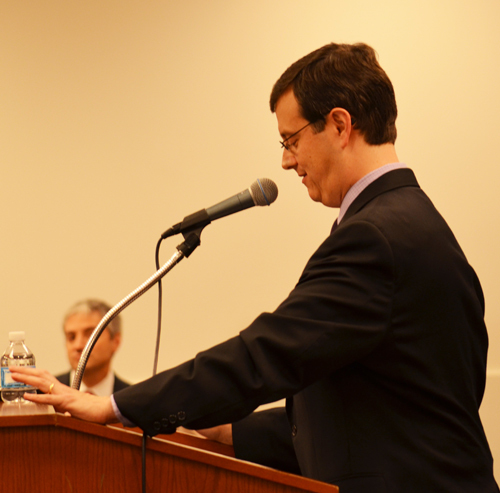 The members of the Board of Education refused to discuss Jackson Potter's challenge to do an arbitration of the "toxic swaps" after Potter finished speaking. Instead, the security swarm was called against Potter when he stayed at the microphone and tried to get a response, pointing out that for a very small cost, the Board stood to recoup hundreds of millions of dollars if the arbitration found that the banks had misled CPS when the swaps were entered into a decade ago. Later, though, Potter had left. 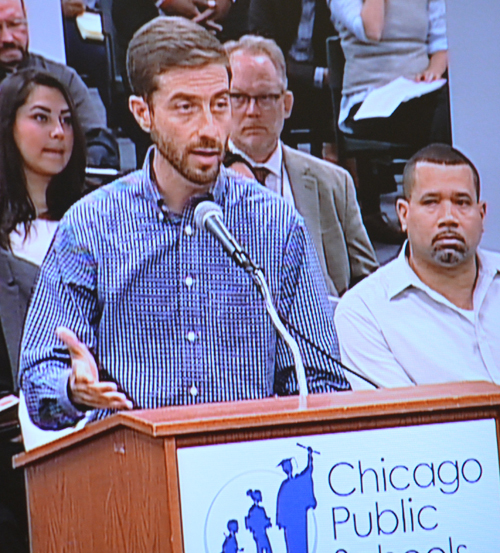 Then the Board members repeated their carefully scripted lines about "true facts" and sent a clear signal that they were not interested in learning whether Arne Duncan and an earlier Board had illegally and mistakenly allowed CPS to lose hundreds of millions of dollars. Substance photo by George N. Schmidt.Martin Ritter, a West Loop resident and Chicago Teachers Union organizer, suggested that the Board choose the Honorary Student Board Member from the students at Dyett High School in Washington Park. Ritter noted that the remaining students at Dyett are now learning online. He added that what had occurred the previous night, when a group of people chained themselves to the state of George Washington at City Hall, was not violent disobedience, but civil disobedience. Reminding the Board that the Dyett community has long had a presentation for the school in front of the Board, he said that a green technology high school is what the community wants in Washington Park and the Board needs to interact with them. Then it was time to raise praise for AUSL and "turnarounds." Enis Daniels, a parent of two and uncle of nine at Chalmers Elementary School, said that the school was in its second year of turnaround with Academy for Urban School Leadership (AUSL) and it was great: there were small class sizes of around 23, grades 3-8 all had iPads, and there are 40 spots for a full-day pre-K. The public participation concluded with more discussion of overcrowding. Kristen Boeke-Greven, on the LSC at Decatur Classical School, said the school needed to have seventh and eighth grades added, so that the school can become a K-8 school. Presently the school only goes up to sixth grade. She said that the lack of a seventh and eighth grade puts too much pressure on the kids to find a school to attend before going to high school. She asked that the building be expanded or moved to Stewart Elementary because the existing space cannot accommodate the needs of the students. She added that there is no cafeteria, no gym, and no assembly room. Jeannette Schar, also of Decatur Classical School and chair of the LSC, spoke of the need for expansion. She said that Decatur is one of the top elementary schools in the state, it is diverse, and last year there were 3,000 applications for 80 openings. She added that the alderman is committed to working with the community. She urged that the school be moved to the now closed Stewart Elementary. After many comments by Board members, the Board went into closed session.